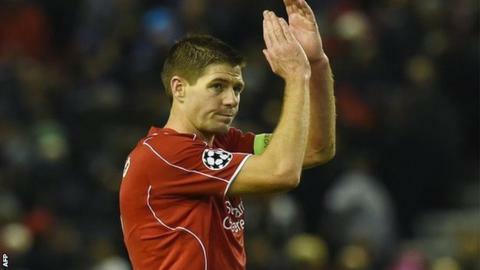 Liverpool captain Steven Gerrard called his decision to leave at the end of the season "the toughest" of his life. The 34-year-old, out of contract this summer, joined the Reds aged nine and has scored 180 goals in 695 games. "This has been the toughest decision of my life, one both me and my family have agonised over for a good deal of time," said the ex-England midfielder. He added he would continue to play but not for a potential rival as he could "never contemplate" facing Liverpool. Gerrard is being linked with a move to Major League Soccer in the United States once the English season ends. He stressed: "I won't be playing for a competing club and will not therefore be lining up against Liverpool. "My decision is completely based on my wish to experience something different in my career and life and I also want to make sure that I have no regrets when my playing career is eventually over. "From now until the last kick of the last game of the season, I will be as fully committed to the team as I ever have been and giving everything I have to help Liverpool win games." Gerrard, born in the Merseyside village of Whiston, joined Liverpool's academy when he was nine years old, making his first-team debut as a substitute against Blackburn Rovers in November 1998. He led the club to the Champions League title in 2005, scoring his side's first goal as they came from three down to draw 3-3 against AC Milan and then win on penalties. He has also won the Uefa Cup, two FA Cups, three League Cups, one Community Shield and two Uefa Super Cups, and earned 114 England caps before retiring after the World Cup. Liverpool manager Brendan Rodgers said: "It is almost an impossible task to find the words to appropriately sum up Steven Gerrard and his importance to Liverpool. "This is an era where the word 'legend' is vastly overused, but in his case it actually doesn't do him justice." Liverpool striker Rickie Lambert, a boyhood supporter of the club, described Gerrard as "Mr Liverpool". "He is number one for me and he always will be. He has meant everything to me growing up," added Lambert. "The nights he has given the fans are unbelievable. I'll never forget them and I know the Liverpool fans will never forget them." Reds forward Mario Balotelli compared Gerrard to Italian World Cup-winning midfielder Andrea Pirlo. "I think of him as being at the same level as Pirlo," said Balotelli. "Vision, technique but he is powerful as well. "Steven can do anything, he is an amazing player. It's going to be very difficult for the team to find another player like him in the future." Former Reds midfielder Terry McDermott put Gerrard above Liverpool greats Kenny Dalglish and Graeme Souness. "Kenny and Souey shone in great Liverpool teams, but Gerrard has played in sides that were at best mediocre and he carried them to trophies," said McDermott. Speculation about Gerrard's long-term Liverpool future intensified following a newspaper interview in October in which he said he would join another club if he was not offered a new contract at Anfield. In December, Rodgers said the player had been offered a new deal, at the same time dismissing reports the pair had fallen out. "Steven Gerrard's decision will leave a hole that manager Brendan Rodgers will find incredibly difficult to fill. Gerrard remains an iconic figure, a footballer who arguably competes with Kenny Dalglish for the title of the greatest ever to wear the red shirt." Gerrard was an unused substitute for Monday's 4-1 Premier League win over Swansea, although he returned to the starting line-up for Thursday's match against Leicester, scoring two penalties in a 2-2 draw. Club owner John W Henry and chairman Tom Werner said in a joint statement that the news "stirs many strong emotions for all of us connected with the club". "There is sadness that such a great player and person is leaving and won't be playing for Liverpool beyond this season," they added. "But there is also a sense of celebration and gratitude, that we've all been privileged to watch and work with one of the true greats, not just of this club, but the game in general."